Porsche builds high performance vehicles which require tyres adapted to these performances. To this end, Porsche integrated tyre selection in the development process of each vehicle. Tyres which have undergone the tests and obtained validation by Porsche are then accredited with an "N" specification. The Porsche specifications are as follows: N0, N1, N2, N3, etc. These indications on the side of the tyre mean that these tyres have been accredited by Porsche. The numbers following the "N" code: 0, 1, 2, 3 represent the various accreditations by Porsche over time. This means that N0 was the first tyre accredited. Thereafter, based on the modifications made on the tyre, this same reference is identified as N1, then N2, etc. When a new tyre is selected by Porsche, the index starts at N0 once again. Watch out, it is absolutely necessary to select tyres accredited by Porsche as these have been designed for your car. Sports car tyres make a major contribution to the ability of high performance sports to "stick to the road". Their tyres are very complex products meeting numerous, largely contradictory demands. Finding the proper structure that balances these demands for any given application is the great challenge in tyre design. Porsche manufacturers and designs some of the highest performance vehicles in the world, as a result tyres play an integral role in vehicle performance. Porsche has integrated tyre development throughout their process of vehicle development. To be an Original Equipment tyre provider on a Porsche vehicle or be approved by Porsche for the replacement market requires the joint product development efforts of the tyre engineers working alongside the Porsche vehicle engineers. Production tyres that have passed all of the tests and received the engineering department's release can be branded with an N-specification. The N-specification brandings include: N-0 (N-zero), N-1, N-2, N-3 etc. These markings on a tyre's sidewall clearly identify them as approved by Porsche for their vehicles. The N-0 marking is assigned to the first approved version of a tyre design. As that design is refined externally or internally, the later significant evolutions will result in a new generation of the tyre to be branded with N-1, N-2, etc, in succession. When a completely new tyre design is approved, it receives the N-0 branding and the succession begins again. The focus in recent radial tyre development for Porsche vehicles has included optimum handling on dry surfaces and the safest possible behavior on wet surfaces, even at high speeds. Tyres developed by various manufacturers, in concert with Porsche, offer a specific set of wet grip properties which few, if any, other automobile manufacturers demand in equal measure from the tyres they use on their vehicles. Tyres may be specified for a particular vehicle or range of vehicles and must successfully pass the tyre company's laboratory, track and race tests to assure that they would be capable of adequately supporting the Porsche vehicle. Approval testing ensures tyres can reach their top speed on the Autobahn whilst meeting Porsche's noise, hydroplaning, high-speed durability, uniformity, serviceability and handling requirements. It is recommended that only matching tyres be used on Porsche vehicles. Since many Porsche vehicles are fitted with differently sized tyres on their front and rear axles, this means matching the tyre make, tyre type and N-specification. If a vehicle was originally delivered with N-specification tyres that have been discontinued and are no longer available, it is recommended to change all four tyres to a higher numeric N-specification design appropriate for that vehicle. Mixed tyre types are not recommended. Tyres should be replaced no less than in pairs on one axle at a time. Only tyres of the same tyre make and type must be used. However, in case of tyre damage such as cuts, punctures, cracks or sidewall bulges that cause a single tyre to be replaced for safety reasons, the remaining matching tyre on that axle must not exceed 30 percent wear to the other axle tyre. Otherwise both axle tyres need replacing, as handling inconsistencies may result if this is not done. Brand new tyres do not offer their full traction during the first 60-100 miles, therefore drivers should therefore drive at moderate speeds in order to bed in new tyres. If new tyres are installed on only one axle, a noticeable change in handling occurs due to the different tread depth of the other tyres. However, this condition disappears as new tyres are broken in. Drivers should adjust their driving style accordingly. 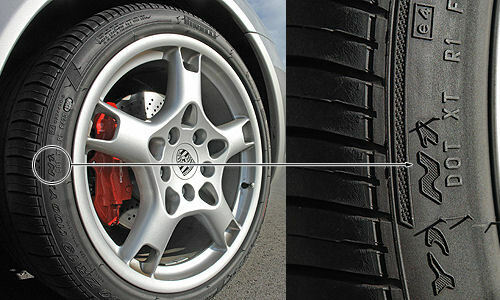 It is also important to know that while Porsche N-specification tyres have been fine tuned to meet the specific performance needs of Porsche vehicles, the tyre manufacturers may also build other tyres featuring the same name, size and speed rating as the N-specification tyres for non-Porsche applications. These tyres may not be branded with the Porsche N-specification because they do not share the same internal construction and/or tread compound ingredients as the N-specification tyres. Using tyres that are not N-specific is not recommended and mixing them with other N-specification tyres is not permissible. You will find your speed rating on the side of your tyre. Like in the image displayed here, the speed rating can be found at the end of the tyre size. It is always represented by a letter. In this case, a "Y". Once you know your tyre size, you can work out what is the maximum speed that your tyre can handle. For example, the "Y" rating seen in the image, tells us that this tyre can reach speeds of up to 186mph. Speed ratings are based on scientific tests where the tyre is run at speeds in 6.2 mph steps in 10 minute increments until the required speed has been met. You will notice that it bears a remarkable resemblance to the labels used for electric goods in the EU. 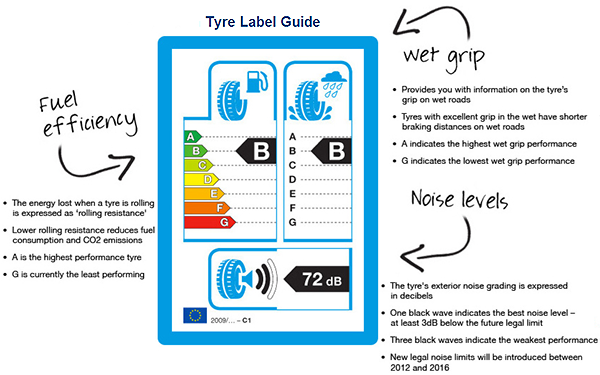 However, unlike the electrical labels, the tyre label doesn't focus on energy ratings. It shows you the grade given to 3 important categories that should be considered when choosing a tyre: (1) Fuel Efficiency (2) Wet Grip and (3) External rolling noise. The main goal of the new legislation is to provide more information to motorists on the performance of tyres. By doing this, the EU hope to increase road safety, make shopping for tyres more cost-effective and reduce the impact tyres have on the environment. With each tyre on the market being tested and classified using the same criteria, vehicle owners will now be able to make a more informed decision when shopping for new tyres - with tyres easily comparable for these specific capabilities. This is an 'N' Rated Tyre, on a closed race circuit, MICHELIN Pilot Sport Cup is quicker on average compared to its principal competitors. The leading track tyre for the road. Used as original equipment on the 911 GT3 RS and 911 Turbo this tyre is built for pure performance driving. The Michelin Pilot Sport Cup is a competition tyre designed specifically for serious performance enthusiasts such as track day drivers. Featuring a racing tyre tread compound built for the track, best when being used at 70 - 100 Centigrade. If you're driving in cold, icy or snowy weather you should be very aware that this tyre does not do well in these conditions. The Toyo R888 is a road legal track day tyre (not N Rated), used by a large selection of Porsche 911 track day drivers, as effective alternative to the Michelin Pilot Sport Cup track day tyre, which is fitted by Porsche to new 911 GT3's. Designed by the Toyo Motorsport Team using the latest computer modeling, the R888 is one of the most sophisticated track day tyres offering maximum performance. The R888 boasts an outstanding compound which delivers outstanding results in the dry and wet, with a medium soft compound that has performed significantly better than soft compound competitor track day tyres. Some road legal track tyres have to provide warnings about their use in the wet. Whilst it is not designed as a wet tyre, the R888 outperforms other track tyres here, so if there is a down pour on a track day, drivers can continue rely on its performance on track and for the journey back on normal roads. Precautions for use of Road Legal Track Day Tyres on the Road. These types of tyre are homologated for road use and meets all the legal requirements for use on the open road. However, the tyre is designed for track use, and in these conditions offers clear advantages in dry grip and cornering when compared to standard tyres. The main characteristics that give this performance gain are a reduced original tread pattern depth, and a special construction in the crown area.